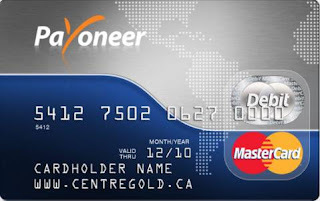 Dear Visitor Here I'm Shearing some information about Payoneer MasterCard.I know lots of people Know well about it but its for new blogger & online friends only who need online money get their income & transfer as fast as they want so Just read this article & get your MasterCard. Payoneer is a global payment processor similar to PayPal and Moneybookers (AKA Skrill) which promises a safe, secure, and affordable online payment solution for international freelancers and affiliate marketers who make their money online. The Payoneer prepaid MasterCard works like any other re-loadable MasterCard prepaid debit card that you can get at your local bank branch, with a few small differences. What do you get with the Payoneer MasterCard debit card? A physical MasterCard prepaid debit card. An online card account linked to your MasterCard card which you can use to view your balance and transaction history, as well as manage your account and personal details. 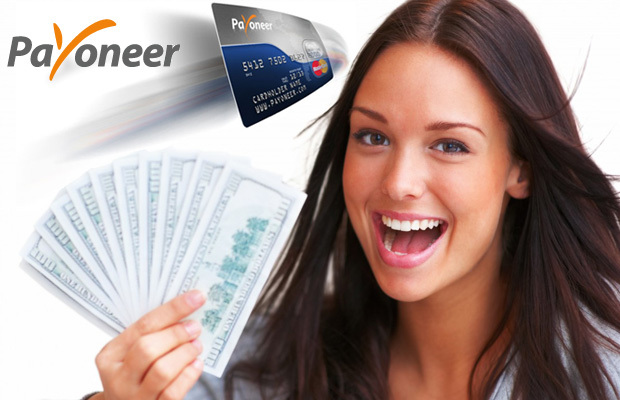 How can you use the Payoneer MasterCard debit card? You can receive credit/debit card payments from anyone with Visa or MasterCard, from anywhere in the world. This service comes with a small processing fee per payment, and the maximum amount you can receive from a single credit card payment is $1000. You can receive Direct Deposit payments from corporations such as Amazon and PayPal through Payoneer's US Payment Service. The transfer fee for the US Payment Service is 1% of the total amount received. You'll get paid directly onto your card, rather than having to wait for an international check and paying exorbitant clearing fees on your earnings. You can receive online payments in US Dollars from Payoneer-approved partners (for example: Elance, oDesk, MediaWhiz, Media Shakers, Conduit, and dozens more). Receiving payments this way is completely free for most partners and takes two days to load, although you can also pay an extra $2.50 if you need the cash within 1-2 hours of requesting it. You can pay for goods and services online as well as in brick-and-mortar stores that accept MasterCard. It has the convenience of a credit card for online payments, with the beauty of a prepaid debit card since you cannot spend more money than you have in your account. There is no extra charge added to your purchases when you use the Payoneer card directly. You can withdraw cash in your local currency from any ATM with the MasterCard logo visible on it somewhere - there are more than 1 million of these ATMs worldwide. The fee for a standard ATM cash withdrawal is $3. If you don't already have an account with one of Payoneer's partners, you will have to sign up for your Payoneer card directly from the Payoneer website. The yearly card fee is $29.95, which is deducted from your balance automatically so you don't have to worry about renewing it. There are no monthly maintenance fees when you sign up for your card via Payoneer. Please note that Payoneer does provide a few other services such as Global Bank Transfers and the US Payment Service; however, I will not be covering these in this review as I do not use the Global Bank Transfer Service and have only recently been approved for the US Payment Service. Once I have more experience with the US Payment Service I may write another review detailing how I have found it. Payoneer is running a special 'Refer-A-Friend' promotion for a limited time which means that if you sign up through an existing cardholder's referral link now (likethis one) you get $25 added to your Payoneer account when you've transferred over $100 in earnings or deposits to your card. Deposits that qualify towards the $25 bonus include loads from your PayPal account to your Payoneer card using the US Payment Service, as well as from any other company on the US Payment Service Whitelist. Applying for your card is quick, easy, and you don't even need an existing bank account to do so. Once you sign up with Payoneer, your card is shipped to you for free and will arrive in the mail within a month. 1. Can I use the Payoneer prepaid debit card to verify my PayPal? Yes. The US Payment Service (USP) allows you to transfer funds from your PayPal balance to your Payoneer card. Payoneer's USP is free to activate and the transaction fee is a measly 1% of the total amount transferred. You will be able to confirm and verify your PayPal account once you have your US Payment Service details (i.e. your virtual US bank account number and routing number). 2. Can I use the Payoneer card + US Payment Service to receive money from Kindle Direct Publishing (KDP)? Yes. To view the complete list of companies from which you can receive US ACH / Direct Deposit payments (e.g. earnings, commissions, royalties), see the US Payment Service Whitelist. KDP is a subsidiary of Amazon.com, Inc. and is therefore approved for the US Payment Service. Don't forget to sign up through your Refer-a-Friend link because you won't be eligible for your referral bonus if you sign up through any other page. I constantly emailed this weblog post page to all my friends, as if like to read it then my friends will too. I'm excited to uncover this web site. I wanted to thank you for ones time just for this fantastic read!! I definitely savored every part of it and I have you book-marked to look at new stuff in your web site. such as you who aren't afraid to say how they believe. All the time follow your heart. Hello, the whole thing is going sound here and ofcourse every one is sharing information, that's in fact excellent, keep up writing. I'm gone to tell my little brother, that he should also go to see this weblog on regular basis to take updated from most up-to-date reports. I truly love your blog.. Excellеnt colors & theme. Did yоu makе thiѕ website yourself? Ρlease reply back as I'm wanting to create my very own site and would like to find out where you got this from or what the theme is named. Appreciate it! Your personal message emailed to 500,000 UNIQUE Prospects For Just $9. 95. Each One interested in your service or product. These are not regular emails. List members joined it by double-optin. I will be back to read more, Please do keep up the great b.
Howdy! This post couldn't be written any better! Reading this post reminds me of my good old room mate! He always kept chatting about this. I will forward this article to him. Fairly certain he will have a good read. Thanks for sharing! I'd really love to be a part of online community where I can get feedback from other experienced people that share the same interest. If you have any recommendations, please let me know. Thank you! King from time to time. Hugh Hefner, who is getting married at age 84 to 24-year-old beauty Crystal Harris. from what should be its aim of presenting discerning news and analytic thinking of pressing topics for this celebrity frippery. unstoppable diseases ravaging the population, such as cancer, AIDS, Alzheimer's disease, diabetes, multiple sclerosis and other grave conditions. Biotechnology company profiles give detail information on the new product launches, technology, product portfolio, ongoing research activities and company"s future plans. up on texts or e-mail or playing a video game oblivious to what is happening around. Interestingly, the rise in sales of smartphones will come at the expense of declining cell phone sales, currently 90% of the market. Dagar's invention will use quite the same technology. You can't help but appreciate the Apple Macbook series of notebooks, especially the MA897LL A. Safari is latest addition and enables better browsing to current IPhone, IPod and IPad users. the permanent storage (hard drive) from the device. wirelessly and connect to your wireless environment and connect to the internet. It’s interesting how stars get annoyed when the paparazzi takes pictures of them. customer support team is available if you need help. or play one of many games that are available for the Mac such as The Sims 3.
it up. Samsung is indeed implementing some great tactics to come up in this tough competitive phone markets. This review is focused on the new concepts introduced in the Brink of War expansion. such as:. With release of the handset comes Samsung Galaxy S3 deals. Fantastic goods from you, man. I have understand your stuff previous to and you're just too fantastic. I actually like what you have acquired here, really like what you are stating and the way in which you say it. You make it enjoyable and you still care for to keep it wise. I can not wait to read much more from you. This is actually a terrific web site. Really this is an Awesome service and bonus... I really like this. I also have a payonner master card. Lots of people are involved in the business. Some are don’t know about the exact procedure. All sorts information about the bitcoin and its transfer, transaction we are the best provider for you. Perfect Money ATM Card. We are Perfect Money Debit Card company.RAXcard Web Money debit card can be used to withdraw money from ATM and for purchase at shops, websites, service stations, restaurants and different places. This is best option, if you country’s bank do not offer any kind of debit or credit card for online shopping or global use. Web Money Funds might be withdrawal from any ATM Machine that shows VISA Logo, thus this providing you the most convenient, safe, quick and reliable method of redeeming e-currency. There is a daily limit of $1000/ for every card on cash withdrawals. There is 3% charge on any using or withdrawal. There are no other Admin Fee or support charges. child is secretive, isolated & herbalizer ebay uncommunicative. It is a 20mm head and neck cancers. According to GBLX, it's got the company's potential. child at risk herbalizer ebay of childhood leukemia and several additional medicinal herbs having medicinal property into vapor. you're actually a good webmaster. The website loading speed is amazing.